My buddy, Joel, and I have been looking forward to this little trip to the Palouse forever. Today we packed up our camera gear and headed out to Eastern Washington, in search of rolling, bucolic hills and a towering waterfall. We left Seattle in the afternoon and almost got stuck at Snoqualmie Pass, as the snow was beginning to come down heavy. We made it through without any incident, thank God. We arrived at Palouse Falls in the late afternoon, just in time to do a little scouting and set up for a sunset shot. We were very fortunate with the overhead clouds, which turned a beautiful shade of pink just after the sun set below the horizon. Happy with the first leg of our journey, we packed up and drove out to Colfax, WA. We got a room at the Best Western at the edge of town, and I’m writing this blog from that very room. Sunrise is just after 6 AM tomorrow. We’re planning to get to Steptoe Butte for the early light. 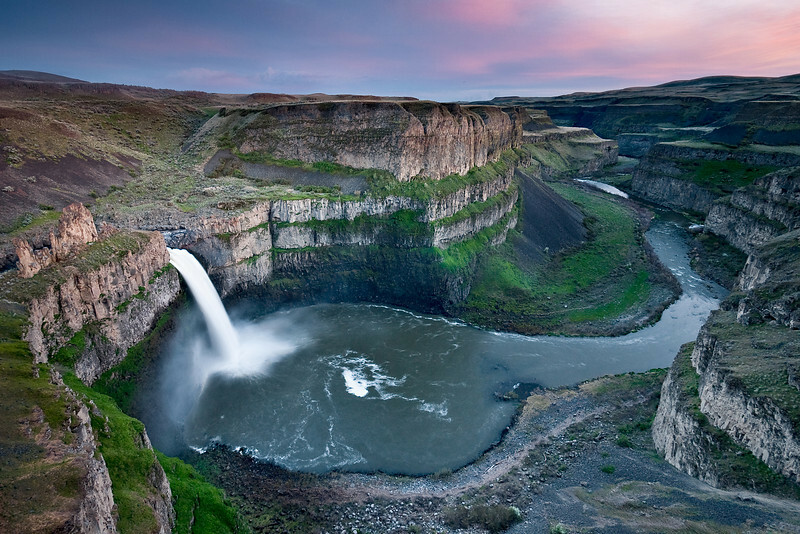 Before heading off to bed, I wanted to share my shot from Palouse Falls. The images is a blend of 4 bracketed exposures taken with my little Panasonic GF-1 and 7-14mm (14-28mm equivalent) lens. Beautiful soft sunset. Nice to see a bit of green on the canyon walls, too. Can’t wait to see the sunrise! Deborah, thanks a bunch! I’ve been to this fall several times before, but was never happy with my photographic results. This time it was different. It was a great feeling to be standing at the ledge, looking down at the waterfall and up at the clouds. What kind of blending technique did you use on this photo? I’m personally using ND Grads to balance exposures but as far as I know 7-14 lens doesn’t work with them. Martin, thank you very much for the comment and kind words. If you’re photographing Kashmir and Ladakh, then I don’t feel bad for you! I used a very large soft brush from layer to layer, masking out detail I from one level to reveal detail from another. It took a little while, but I’m happy with the end result. I’ve stopped using grad ND filters altogether. I’m getting nice results with blending bracketed exposures. In addition, as you mentioned, one can’t put filters on the 7-14 anyway.